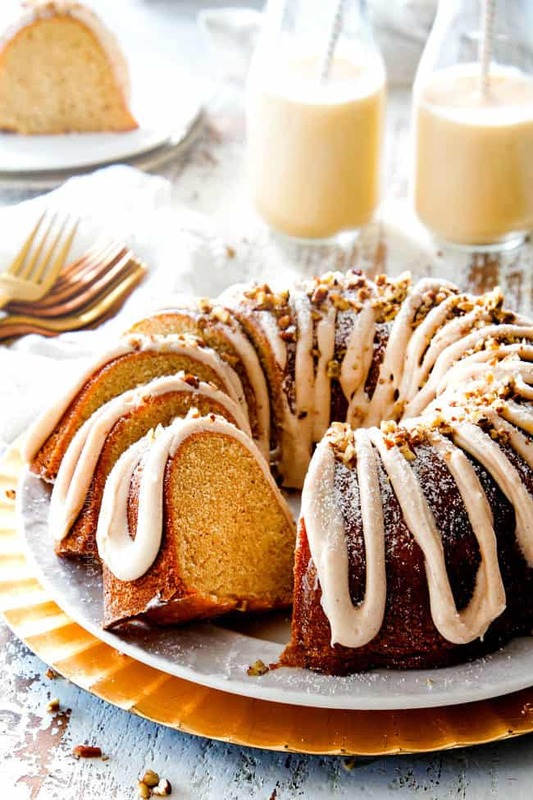 Eggnog Cake is your favorite creamy holiday drink in rich, buttery bundt cake form! 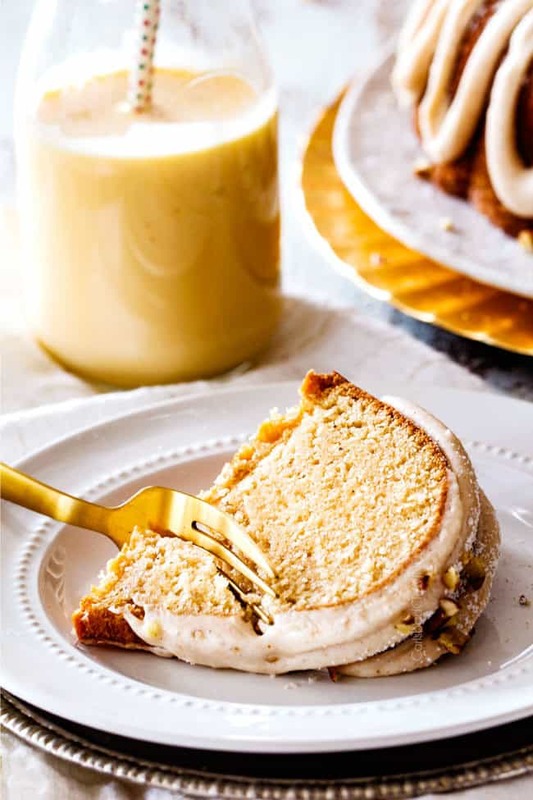 This from-scratch Eggnog Cake is wonderfully moist and tender infused with eggnog, cinnamon and nutmeg then bathed in velvety Eggnog Frosting. It is quick and easy to make and the BEST thing you can do with a carton of eggnog! This tender Eggnog Cake will be the hit of all your holiday parties and everyone will be singing your praises – when they’re not stuffing their faces with luscious cake! Happy Almost December! Are you ready for the holidays?! Our Christmas tree is decorated, our stockings are hung, the Christmas carols have been playing 24/7, I’ve binged at least 4 Netflix Christmas movies and now all that’s left is to drink some iconic holiday eggnog – or in this case EAT some Eggnog Cake! I am a huge eggnog fan, the second I spot eggnog cartons lining the grocery store shelves, they go into my cart, again and again all the way through the holiday season because eggnog = a mug of comforting holiday cheer. If you are like me and don’t want to just drink your eggnog but savor eggnog in decadent dessert form, I’ve got you covered with Eggnog Cookies, Gingerbread Brownies with Eggnog Frosting, Cranberry Eggnog Cheesecake, Cinnamon Eggnog French Toast Casserole and now this festive Eggnog Cake. 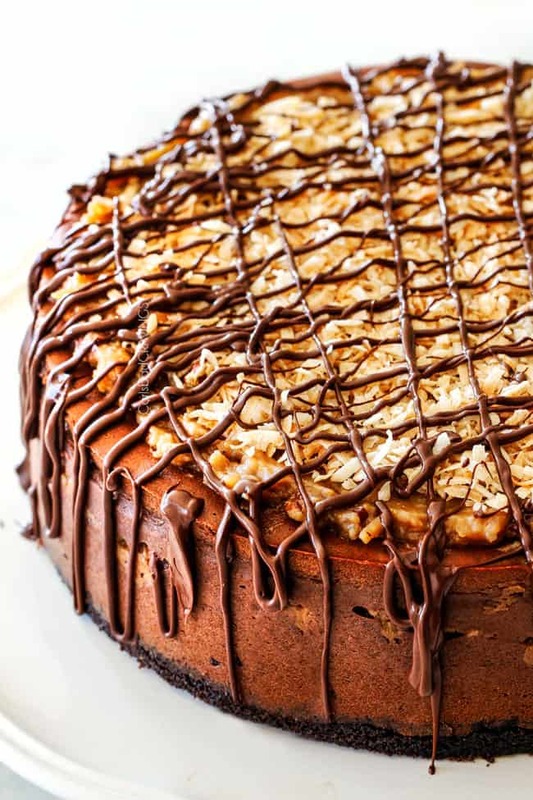 This cake is way too delicious and way to easy to pass up this holiday season! It is easier than making individual cookies, using a candy thermometer for toffee or popping loads of popcorn. It is the biggest bang for your baking buck and you get the decadent flavor of eggnog without pouring it into a glass! 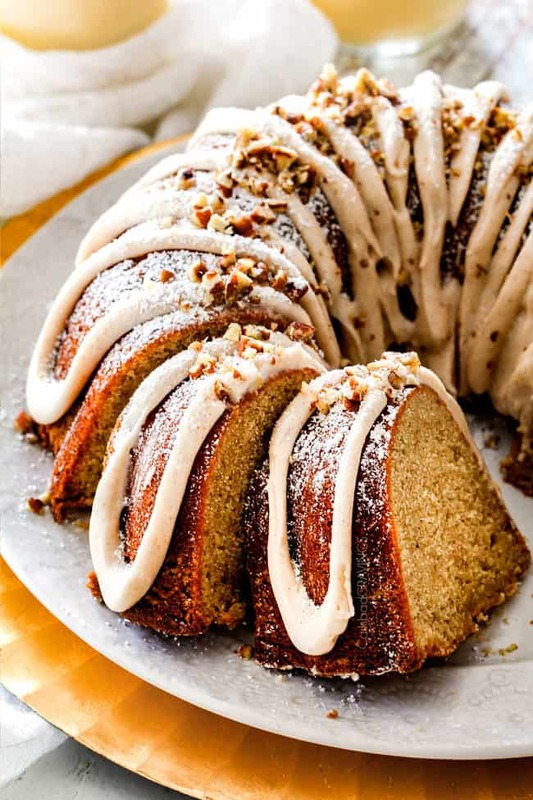 I chose to make this Eggnog Cake into a bundt cake because bundt cakes are like velvet pound cakes in texture – rich, tender, dense and decadent, and more reminiscent of creamy, rich decadent eggnog than light, airy cakes. For this Eggnog Bundt Cake, I started with an already buttery and moist bundt cake recipe and added nutmeg, cinnamon and eggnog in place of the buttermilk. The custard base of eggnog makes it a perfect rich and luxurious addition to the batter. The resulting buttery Eggnog Cake is spectacular. It actually tastes like eggnog without being overpowering – in other words, you won’t be able to stop at one slice of this Eggnog Cake! This Eggnog Cake is satisfyingly delicious on its own – believe me – both Patrick and I couldn’t stop slicing off portions – but it becomes exponentially more delicious with silky Eggnog Frosting. This luscious frosting begins with cream cheese, and butter and is then whipped silky smooth with nutmeg, cinnamon and eggnog. You will want to smother this frosting on everything. I already have plans for it on Red Velvet Cookies and Red Velvet Brownies because I can’t get enough! 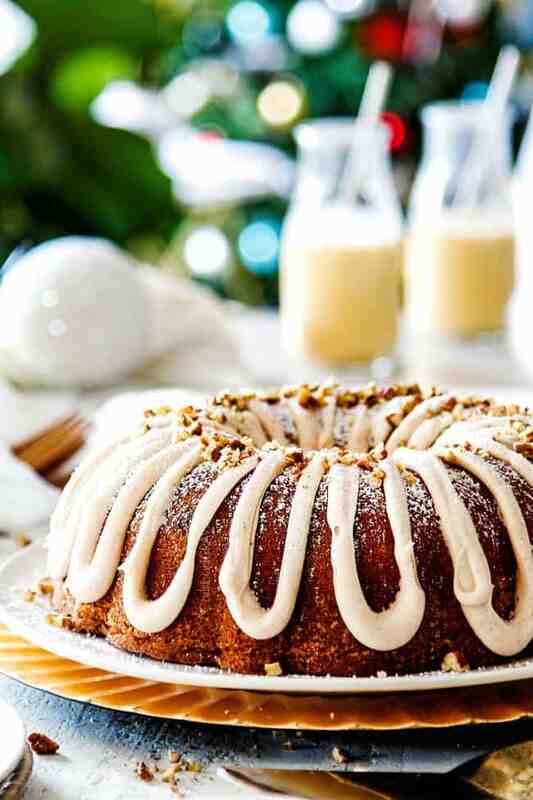 Grease Bundt Cake Pan: You will need a 12 cup bundt cake pan for this Eggnog Bundt Cake recipe. Take care to grease and flour your pan so your baked cake doesn’t stick. My favorite way to grease my pan is with a nonstick cooking spray WITH FLOUR IN IT – as simple as a 10 second spray! Room Temperature Ingredients. You need room temperature eggnog and room temperature eggs for this Eggnog Cake recipe. Room temperature ingredients mix much easier (so it’s harder to overmix) and result in a softer bundt cake with maximum volume. How To Bring Ingredients to Room Temperature. If you don’t plan enough ahead, that’s okay! Add warm (not hot) tap water to a bowl then add eggs (still in their shells) for at least 20 minutes. You can microwave your eggnog until room room temperature (NOT hot). Cream Until Fluffy: Beat softened butter and sugar at least 3 minutes at medium-high speed. This speed will seem extra fast and 3 minutes might seem extra long, but don’t cut it short! This step is so important because it is the only time you want to whip air into the cake batter to create bubbles. The bubbles will expand as the cake bakes, resulting in a lighter cake. If you don’t cream them enough, your cake will be more dense, not as tender, or rise as high. Don’t peak! Don’t open the oven doors until it is time to check your Eggnog Cake for doneness. Opening the doors can cause your cake to cook unevenly and to fall. 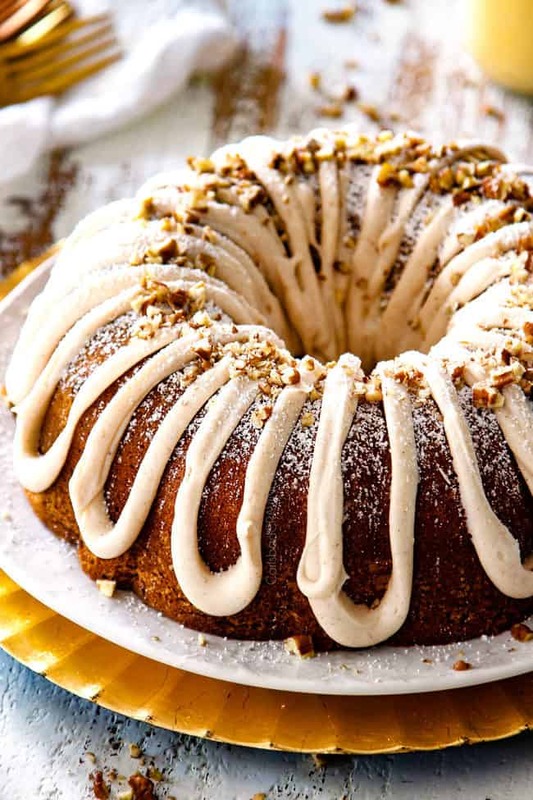 Remove Cake From Pan: It is important to let your Eggnog Bundt Cake cool in the pan for 15 minutes. This allows the cake to retract from the pan and become firm enough to remove without breaking. If you leave your cake in the pan for too long, however, then it can become damp and stick to the pan. Don’t microwave cream cheese or butter: For the Eggnog Frosting, use cream cheese and butter softened at room temperature. If you soften them in the microwave, they will be too runny. Create Frosting or Glaze: I’ve kept my Eggnog Frosting thick with just 2 tablespoons of eggnog but if you would like more of a glaze consistency, simply add additional eggnog to thin frosting. Piping Bag. If you don’t have a piping bag for frosting, then create your own by transferring frosting to a plastic bag and snipping the corner. Piping is optional, you can create a glaze and drizzle all over cake with a spoon. 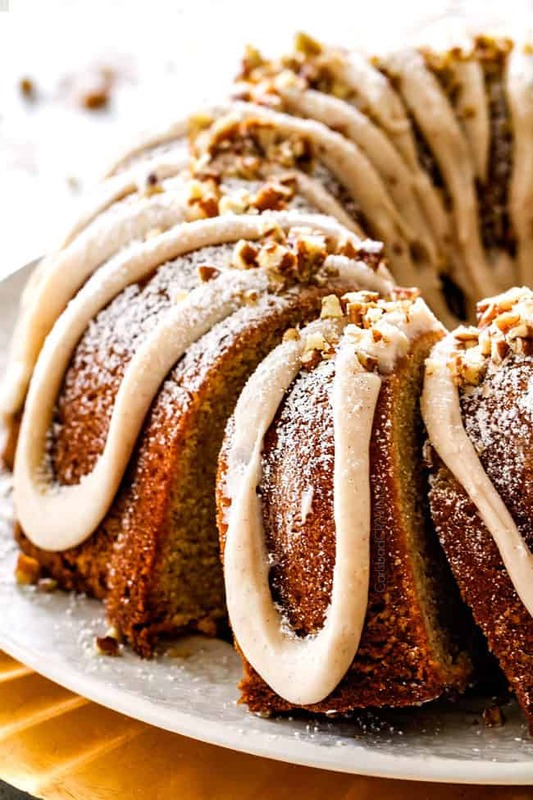 HOW DO I REMOVE MY EGGNOG BUNDT CAKE FROM THE BUNDT PAN? 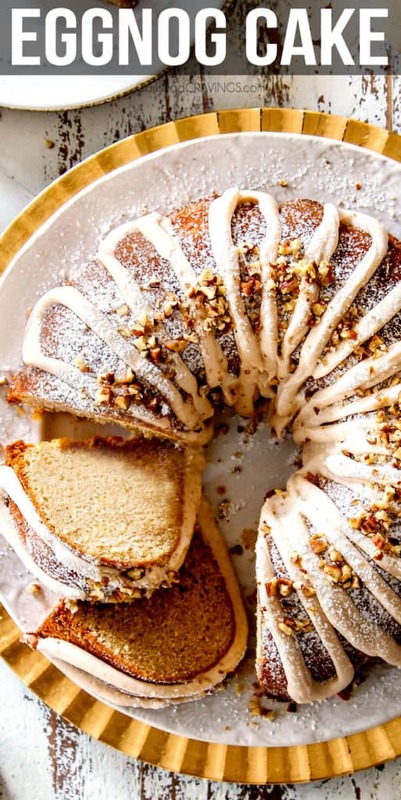 Let Eggnog Bundt Cake cool for 15 minutes. Let the Eggnog Cake cool completely on the wire cooling rack. CAN I MAKE EGGNOG CAKE AHEAD OF TIME? This Eggnog Cake can be made one day in advance, but I wouldn’t make it much further in advance for optimal tenderness. Once your cake has cooled completely, wrap it tightly in plastic wrap and let it sit at room temperature. You can make the Eggnog Frosting ahead of time as well and refrigerate until ready to use. You may need to whisk in additional eggnog when ready to use as it will thicken in the refrigerator. CAN I FREEZE EGGNOG CAKE? Yes! 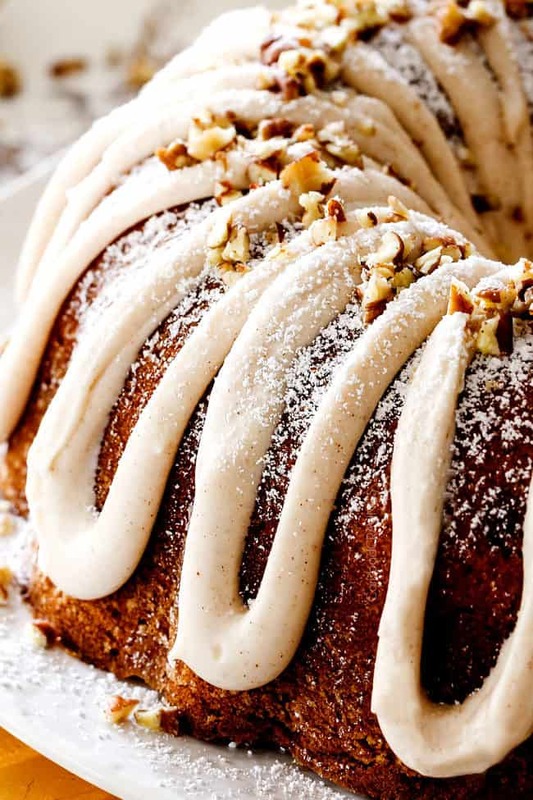 You will want to wait until your Eggnog Bundt Cake is completely cooled then wrap it tightly in plastic wrap WITHOUT the Frosting. The frosting should not be frozen. Freeze cake for up to 3 months. Allow you cake to thaw overnight in the refrigerator before serving. 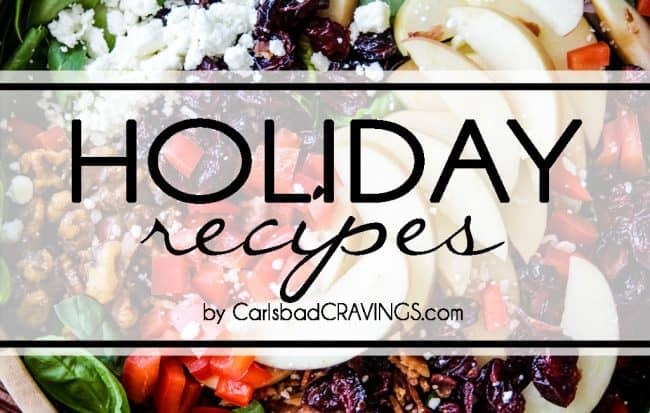 LOOKING FOR MORE HOLIDAY CAKE RECIPES? Want to try these Eggnog Cake Recipe? 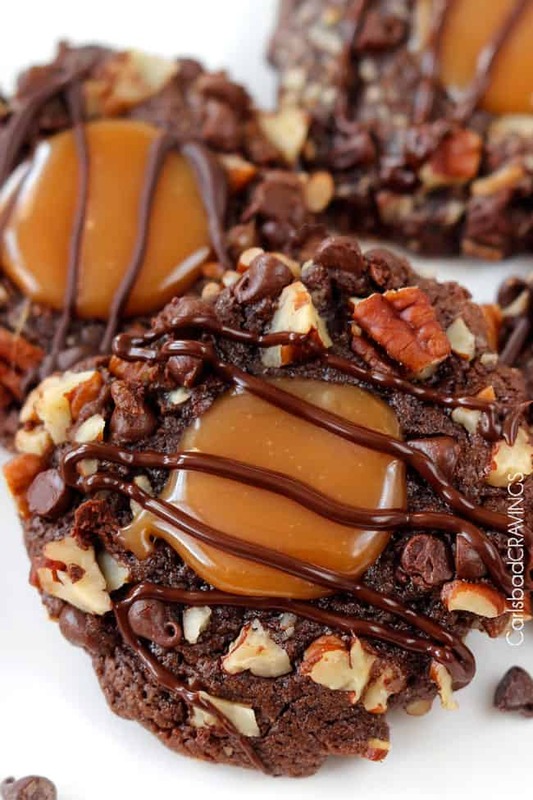 Pin it to your DESSERT, CHRISTMAS or COOKIES Board to SAVE for later! 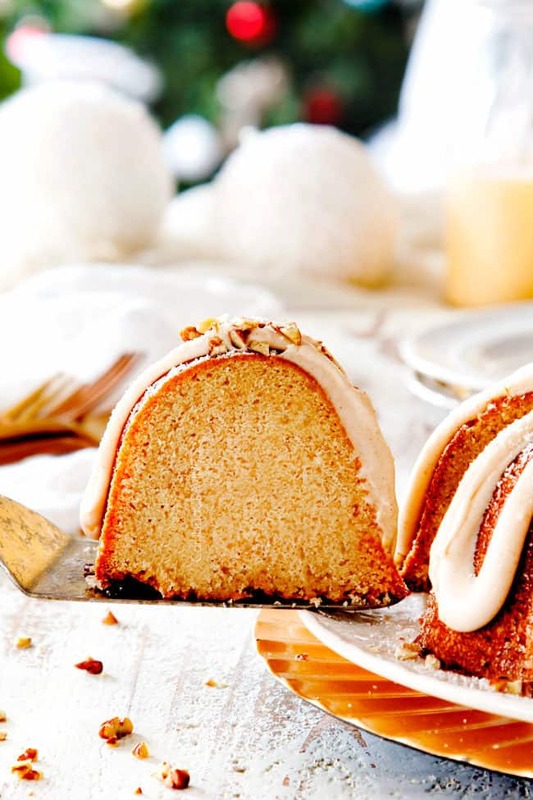 Eggnog Cake is your favorite creamy holiday drink in rich, buttery bundt cake form! 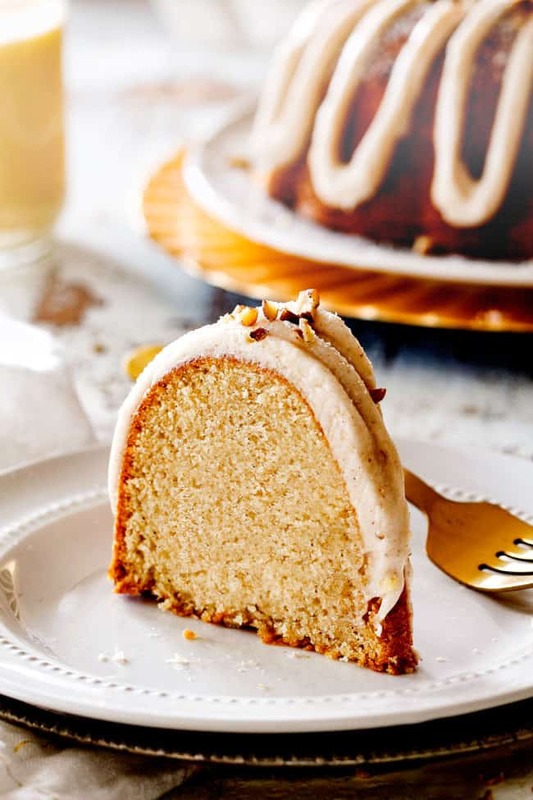 This from-scratch Eggnog Cake is wonderfully moist and tender infused with eggnog, cinnamon and nutmeg then bathed in velvety Eggnog Frosting. It is quick and easy to make and the Best thing you can do with a carton of eggnog. This tender Eggnog Cake is perfect for all your holiday parties and everyone will be singing your praises – when they’re not stuffing their faces with luscious Eggnog Cake! Preheat oven to 350 degrees F and spray all surfaces of a 12 cup nonstick bundt pan with nonstick cooking spray WITH FLOUR OR grease and flour the inside of your pan. Set aside. In a small bowl, whisk lemon juice into room temperature eggnog. Set aside. Whisk flour, baking powder, baking soda, nutmeg, cinnamon and salt together in a medium bowl. Set aside. Add butter and sugar to a stand mixer fitted with the paddle attachment and beat on medium-HIGH speed for at least 3-4 minutes (no shorter! ), until light and fluffy, scraping down sides occasionally. Reduce speed to medium and eggs, one at a time, beating just until the yellow disappears after each egg. Beat in vanilla just until combined. Reduce speed to low and gradually add flour mixture to butter mixture in thirds, alternately with eggnog in between each third. Beat until just combined, giving the batter a final stir by hand to get any flour at the bottom. Transfer batter to prepared bundt pan and tap pan on the counter a few times to get rid of any air bubbles. Bake at 350 degrees F until a wood pick inserted near the center of cake comes out with a few crumbs, 45 – 55 minutes (darker pans will require closer to 40-45 minutes). Let cake cool in pan for 15 minutes then remove from pan to a wire rack to cool completely before frosting. If not frosting immediately, then tightly wrap cooled cake in plastic wrap. Pipe or drizzle desired amount of frosting over cake and serve any remaining frosting with individual servings. I love to warm my cake with glaze in the microwave for 10 seconds or so – so good! 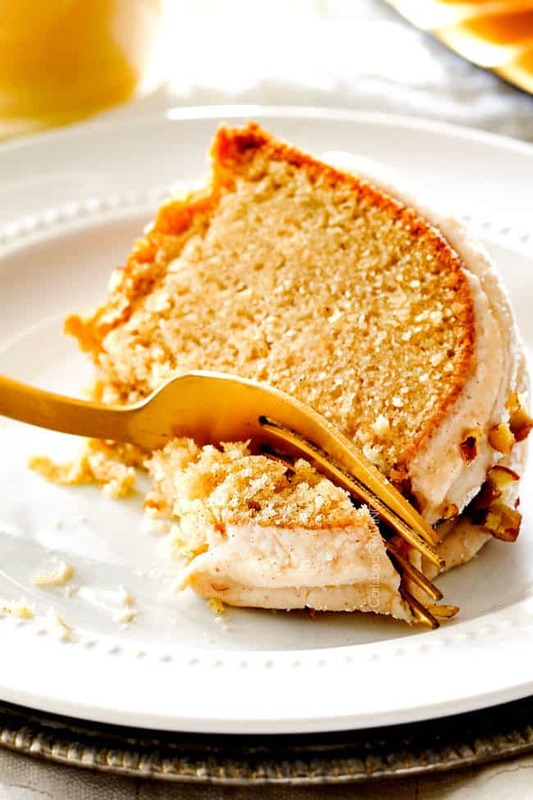 Store Frosted Cake in the refrigerator and bring to room temperature before serving. 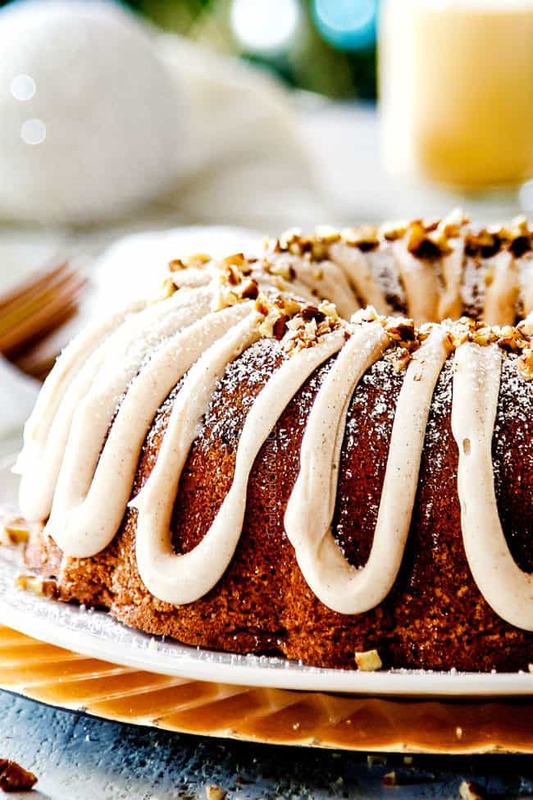 Grease Bundt Cake Pan: You will need a 12 cup bundt cake pan for this Eggnog Bundt Cake recipe. Take care to grease and flour your pan so your baked cake doesn’t stick. My favorite way to grease my pan is with a nonstick cooking spray WITH FLOUR IN IT - as simple as a 10 second spray! Room Temperature Ingredients. You need room temperature eggnog and room temperature eggs for this Eggnog Cake recipe. Room temperature ingredients mix much easier (so it's harder to overmix) and result in a softer bundt cake with maximum volume. How To Bring Ingredients to Room Temperature. If you don't plan enough ahead, that's okay! Add warm (not hot) tap water to a bowl then add eggs (still in their shells) for at least 20 minutes. You can microwave your eggnog until room room temperature (NOT hot). Cream Until Fluffy: Beat softened butter and sugar at least 3 minutes at medium-high speed. This speed will seem extra fast and 3 minutes might seem extra long, but don't cut it short! This step is so important because it is the only time you want to whip air into the cake batter to create bubbles. The bubbles will expand as the cake bakes, resulting in a lighter cake. If you don’t cream them enough, your cake will be more dense, not as tender, or rise as high. Don’t Overbeat: Once you're done creaming the butter and sugar, you want to beat the batter as little as possible. Add the eggs, one at a time, beating just until the yellow disappears after each egg. You never want to overbeat eggs as this will cause the batter to be runny and may cause the batter to overflow when baking. Overbeaten eggs can also create a fragile crust that crumbles and separates from the cake as it cools. Don't overbake! One of the main reasons people complain of dry cakes is because they over bake their cake You want to remove your cake when there are just a few crumbs clinging to a toothpick. What happens if I don’t use full fat egg nog? I had almond milk egg nog. 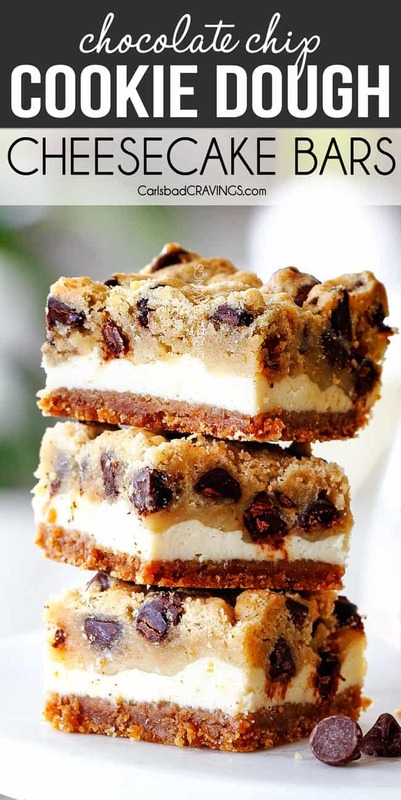 Also I’m thinking about making this as mini quick breads…..I would just adjust the cooking time I assume. Thought it might be a neat holiday gift. Hi Heather, I love the idea of this Eggnog Cake as mini loaves – brilliant for gifts! I have only tested the cake with full fat eggnog so I honestly can’t tell you exactly. My guess is it will probably be fine – if anything just not quite as moist but probably not that noticeable. 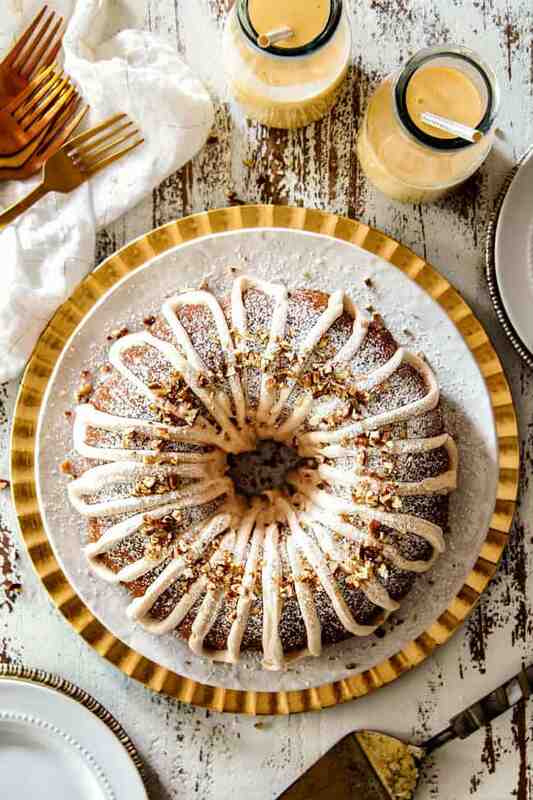 This bundt cake is gorgeous! I wish I had a slice right now! Thank you so much! I wish I could share!!! I made this to bring to a family gathering, and it was delicious! Soooo super moist! Everyone loved it, even my picky children who usually gravitate towards the pre-packaged baked goods. I actually noticed after baking that my husband had accidentally bought low fat eggnog, but honestly it was still so tasty. I guess using full fat might just make it even more moist & delicious! Thank you so much for taking the time to comment Kelly! I am so happy to hear this was a hit and so moist even with lowfat eggnog! Happy 2019!